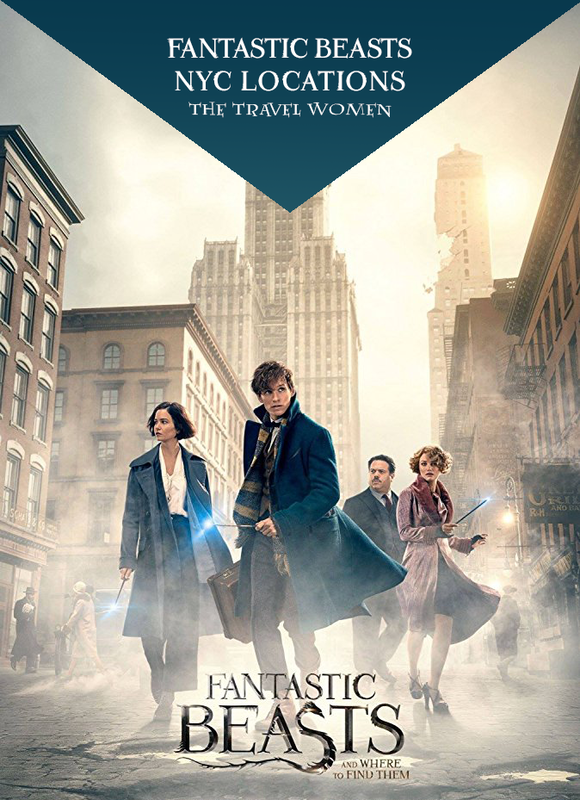 Where do we find the first installment of J.K. Rowling’s Fantastic Beasts series other than New York City in the 1920s? The magical prequel series takes place a lifetime before Harry Potter in 1926 to be exact. Although the sets and effects create a vintage New York City backdrop, the movie was in fact filmed on location in Liverpool, England. Two Liverpool buildings prominently featured include St. George’s Hall for the Senator’s rally and the ticket office at the Cunard Building for Macy’s. Besides these two British locations the majority of streets from Orchard Street to West 59th Street, buildings, department stores, subways, apartments and even bridges are iconic odes to 1920s New York. The characters dressed in flapper attire even negotiate with gangsters in a speakeasy. 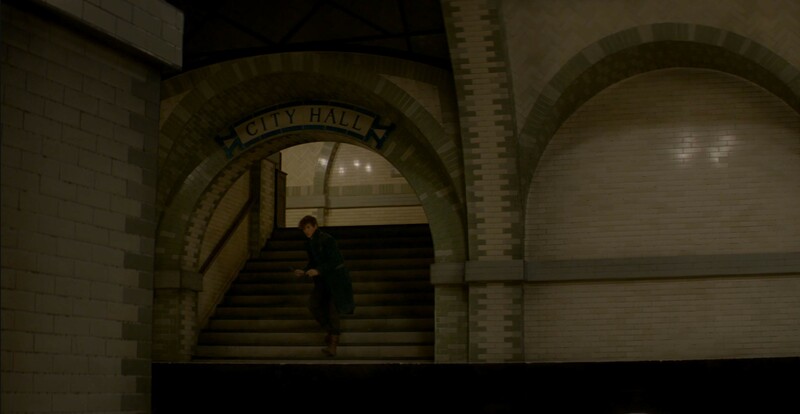 Read on to see which current NYC landmarks, in order of appearance, inspired and appeared in Fantastic Beasts and Where to Find Them. 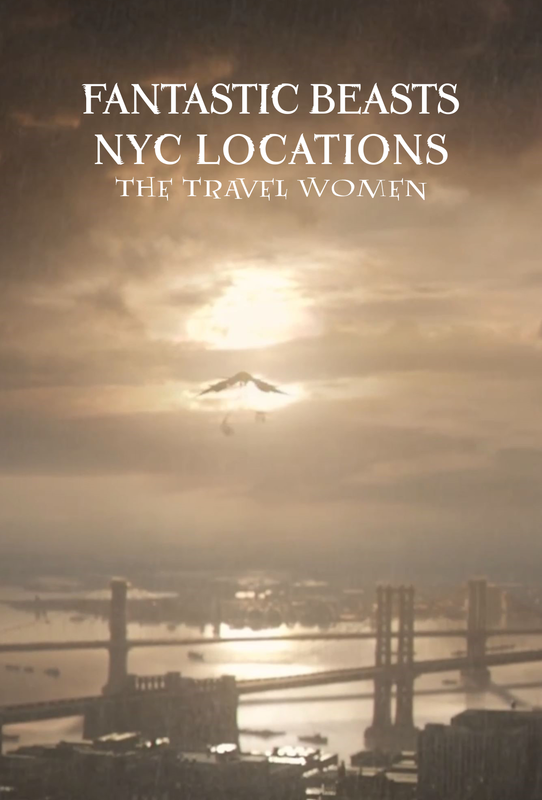 Watch the above video to see the top five NYC locations in person! 1. 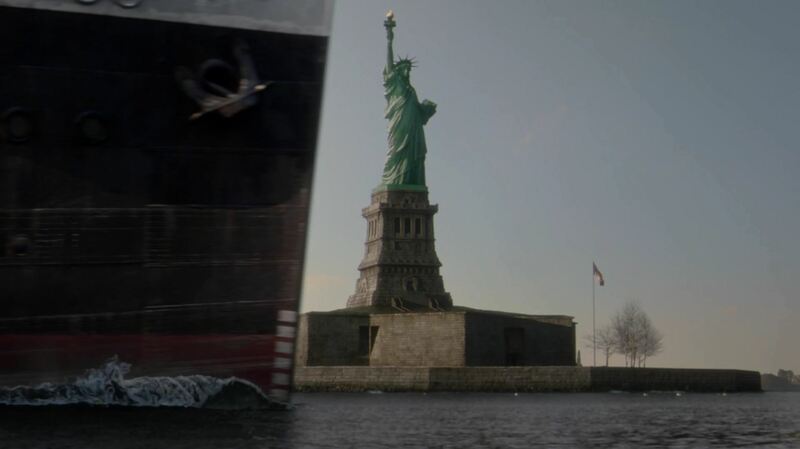 Statue of Liberty and Ellis Island: The movie opens on Newt, the main character, as his boat passes the Statue of Liberty before arriving in Ellis Island. The customs agent, suspicious of Newt, asks him to open his bag and Newt immediately clicks the lock so the contents are “Muggle Worthy,” dodging his first run in with the law to protect the magical creatures inside. 2. New York County National Bank: Located at 300 West 14th Street, the New York County National Bank was constructed in 1907. 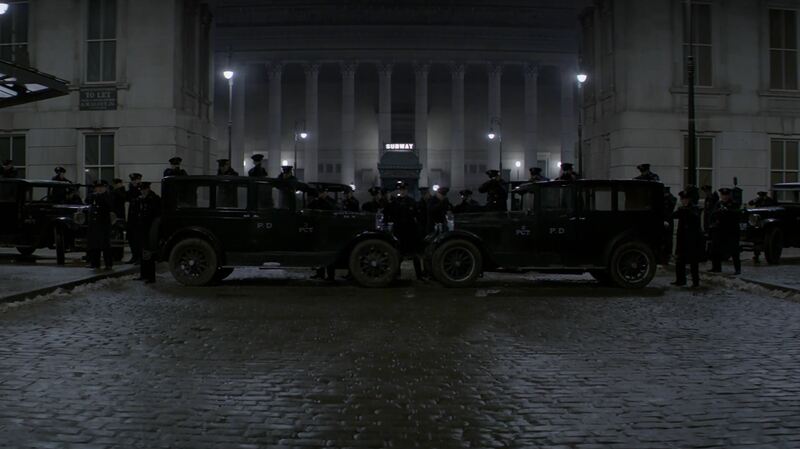 It is likely key inspiration for Steen National Bank where Newt meets Jacob Kowalski at the beginning of the movie. 3. Woolworth Building: The Woolworth Building was the tallest building in the world when it was completed in 1913. Millionaire Frank W. Woolworth commissioned Cass Gilbert to construct the Beaux-Arts white terracotta building with ornate Gothic details. 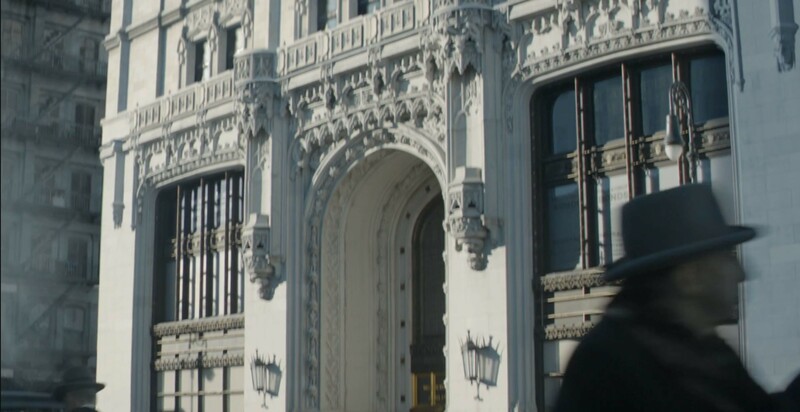 J.K. Rowling chose the Woolworth Building as the MACUSA, Magical Congress of the United States of America, not only for its magical Gothic style but also for an owl detail in the entrance. 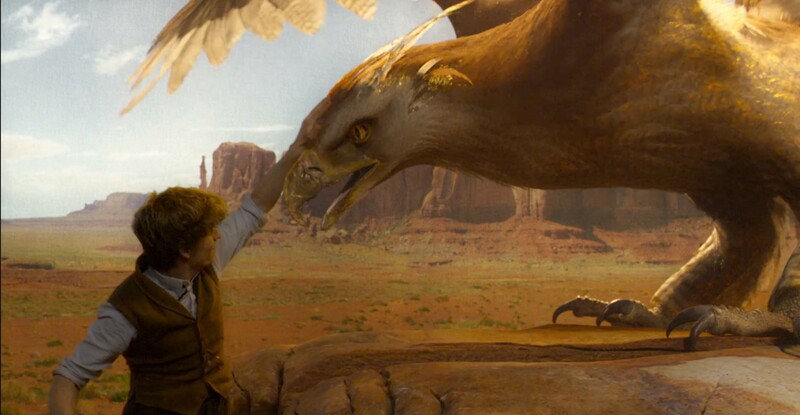 Perched at the top of the arch above the main entrance is a carving of a stone owl that made it a perfect choice for the movie’s magical headquarters. 4. 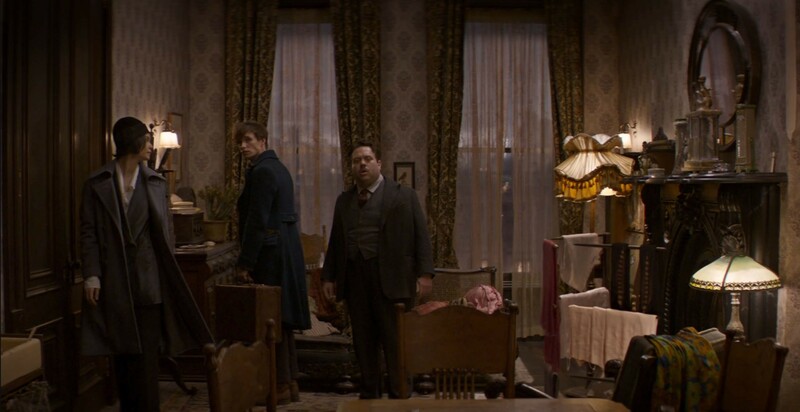 Tenement Museum: David Yates, the director, went undercover with some of his team to NYC to do some location scouting starting at the Tenement Museum. Located in the Lower East Side at 97 Orchard Street the five-story tenement building from 1864 is preserved for tourgoers to see living conditions at the time. It inspired Jacob Kowalski’s apartment in the movie. 5. Manhattan Bridge: After the success of the Brooklyn Bridge the Manhattan Bridge was built to help with Brooklyn’s community growth and opened to traffic in 1909. Did you know that when it first opened there were statues of two women: a Miss Manhattan and a Miss Brooklyn? After fifty years in the elements they were replaced with replicas and relocated to the Brooklyn Art Museum. 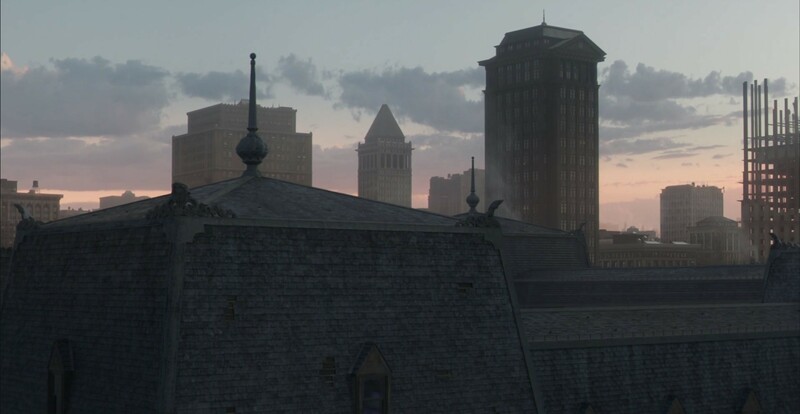 The Manhattan Bridge appears in the movie multiple times, steps away from the Second Salem Church and at the end of the movie as Frank flies over the city skyline. 6. The Writers House: Queenie and Tina Goldstein lived in a Victorian terracotta and red brick building, which is currently 21 West 26th Street, headquarters of the literary agency Writers House. 7. Warshaw hardware: Warshaw Hardware was established in 1925. 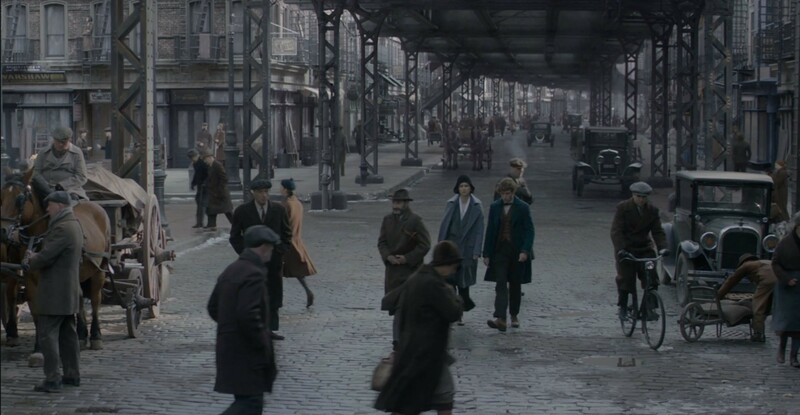 A sign for Warshaw makes a quick appearance in the background of a scene when Newt and Tina walk under an elevated subway line in what might be the Gramercy area. 8. MetLife Tower: A tower appears in the skyline multiple times throughout the movie that is likely the MetLife Tower. The clock tower along Madison Square Park was once the tallest building in 1909 until the Woolworth Building, aka the MACUSA, stole the title in 1913. Many don’t realize that there were plans in the works to reclaim the “tallest building title” as Corbett began building MetLife’s new building on the next block. The design for 11 Madison was a Gaudi meets Art Deco style, but shortly after construction began in 1928 the Great Depression left the 28-story project incomplete. 9. Monument Valley, Arizona: OK, this is not in NYC but it is worth mentioning that within Newt’s bag we travel to what looks like Monument Valley, Arizona to which he is trying to return one of his magical creatures. 10. 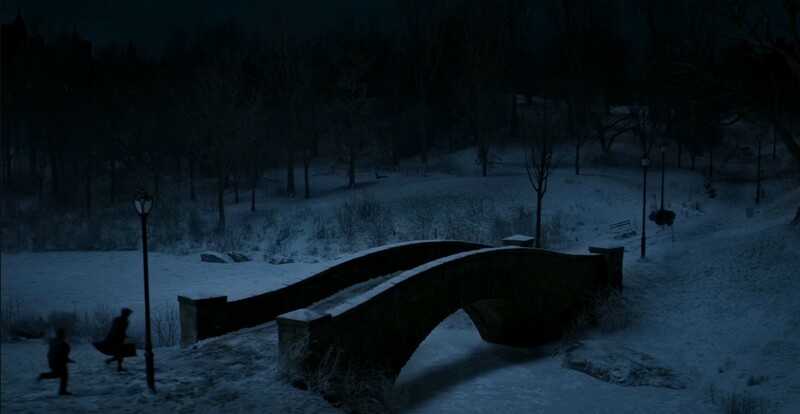 Central Park: Looking for one of Newt’s missing magical creatures, Newt and Jacob venture uptown to Central Park crossing over what looks like Gapstow Bridge and the frozen pond near 59th street. They then enter the zoological garden behind the Arsenal which was dedicated in 1861; the Central Park Zoo as we know it now opened in 1934. 11. Speakeasy: The film is set during prohibition when drinks were found at a local speakeasy. 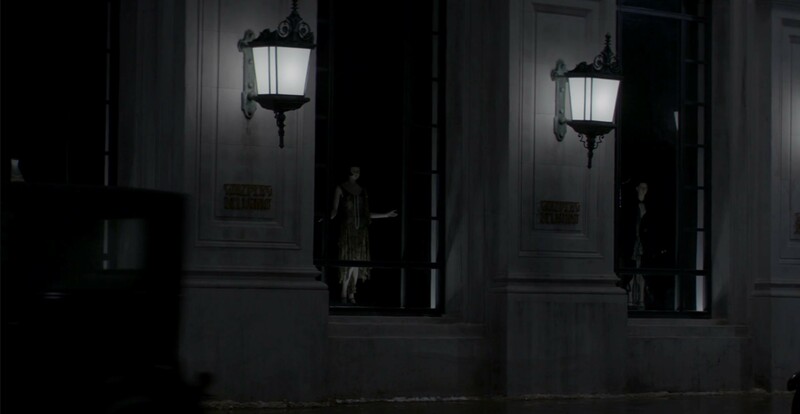 Tina and Queenie lead Newt and Jacob to a speakeasy called The Blind Pig to see if they can find out where a certain invisible creature has been causing trouble. After a few shots of giggle water they bribe a gangster-like character in the subterranean bar. In the background of this scene, the song The Blind Pig plays. The bar is based on speakeasies like the 124 Old Rabbit Club. 12. Macy’s: One of the lost magical creatures is found in Macy’s, one of the largest department stores. The scenes of Macy’s are actually shot on location in the ticket hall of the Cunard Building in Liverpool, though the decorations are meant to mimic holiday displays in Macy’s. 13. Times Square: Even in the 1920s, Times Square, named after the New York Times building, was known for its flashy neon signs and advertisements. 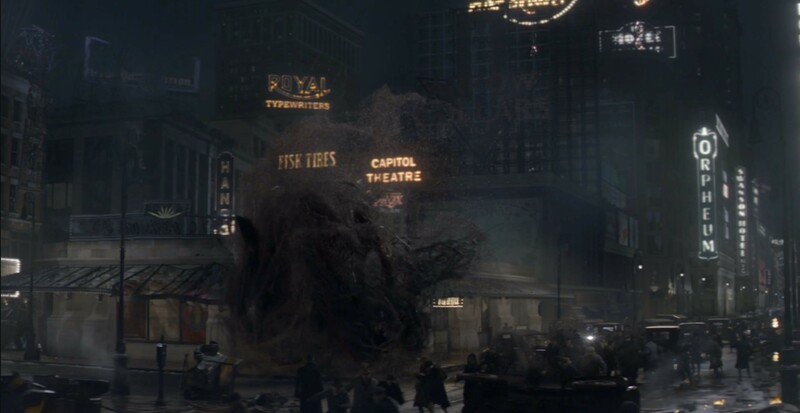 These neon signs are partially destroyed by the monster during the main action scene. Broadway was nicknamed “The Great White Way” as it was likely the first street in America to be fully illuminated by electric lights. 14. City Hall: NYC’s first subway station in 1904 is known for its stunning vaulted ceilings, glass skylights and brass chandeliers. It is no longer an active stop but word on the street says it can be accessed by staying on the 6 line after it goes “out of service” and turns around in the dark City Hall station. It is dark and technically closed to the public except for the often sold out MTA guided tours. 15. 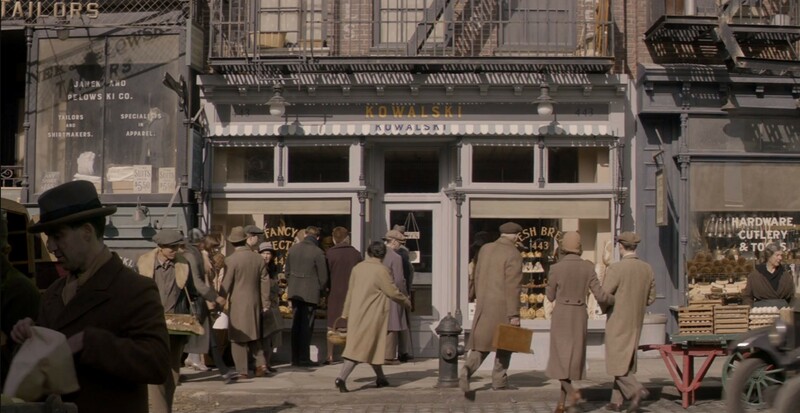 Bakery: Jacob Kowalski’s bakery is located near the corner of Rivington and Orchard Street. We can guess based on his last name that it is either a Jewish or Polish Bakery. Yonah Schimmel Knishes is one of the few Jewish bakeries still in the area that could have possibly inspired some of the treats Jacob sells. The second movie, Fantastic Beasts: The Crimes of Grindelwald, will be released November 16, 2018 and will take place primarily in Paris, France. Comment below if you learned something new about the film or 1926 NYC. Which other NYC movies might you enjoy seeing explored?